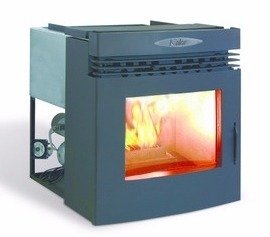 The most efficient and reliable wood pellet stoves on the market! Click on stove symbols below to navgiate to our huge range of wood pellet stove models. Comfort Solutions Ireland are delighted to supply and install Kalor Wood Pellet Stoves. 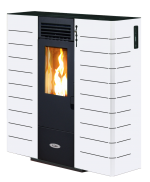 Kalor stoves are manufactured in the Vetetian Province in Northern Italy and are proud to offer the world's most efficient wood pellet stoves. Having worked with Kalor for several years now, we know the quality that they bring to the market and also how reliable their stoves are. Please continue to navigate our website to view the various models and use the following symbols to help identify the stove which suits you. 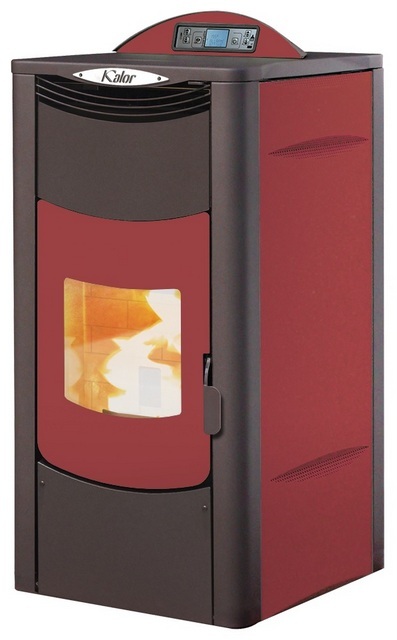 Also see below for more general information on wood pellet stoves. Please contact us at any time through our website contact form, by email or by calling us on (098) 42699. Air Stove A stove which supplies all of its heat to the room in which it is placed. The distribution of the heat is assisted through a small fan. Boiler Stove A stove with an integrated boiler; a boiler stove is suitable for Direct Hot Water and/or central heating. It is suitable for radiators and/or underfloor heating. Ductable Stove A stove, without a boiler, but with one or more "ducts" at the rear of the stove which can easily distribute some or all heat to adjacent rooms through a simple pipe (duct). Slimline Stove A stove designed to save space. Kalor Slimline stoves are only 249mm (10 inches) meaning they are not intrusive into any room in which they are placed. Insert Stove A stove which can be inset into a wall, with only the front "facia" of the stove visible after installation. Insert stoves are very neat and have a "TV screen" appearance. All Kalor stoves are super-efficient and waste less heat to the chimney than any other wood pellet stove on the market. With efficiencies of up to 97%, Kalor comfortably lead the way in terms of efficiency and control. The benefit of Kalor Ductable Stoves is that a portion or all of the heat produced can be ducted to another room or rooms, above or adjacent to the stove itself. This offers huge flexibility and allows easy and cost effective distribution of heat around your home. Kalor stoves offer very pleasing aesthetics with contemporary, modern design and a choice of colours. Whatever your choice of interior decor, Kalor have a stove that will work well with your existing design and colour palette. 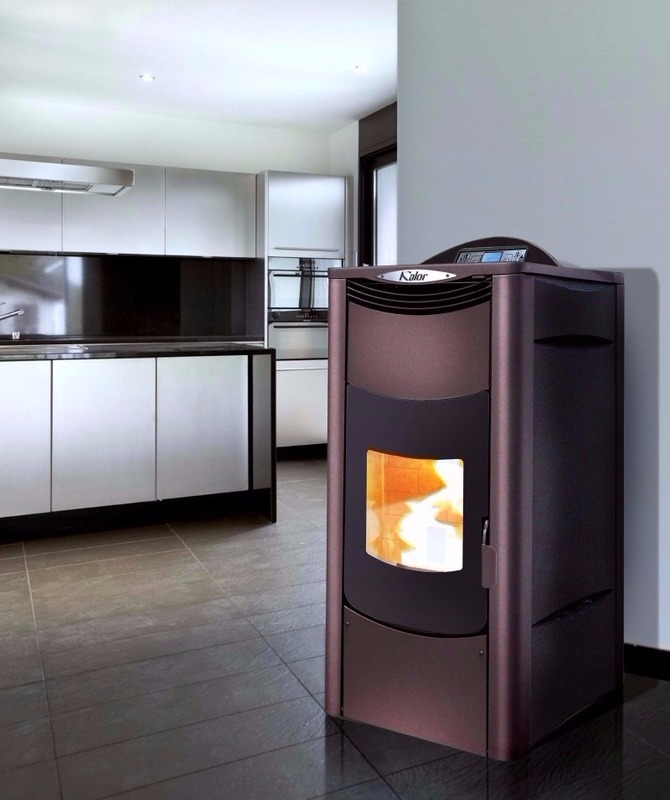 Kalor wood pellet stoves offer a level of convenience that few have even imagined. 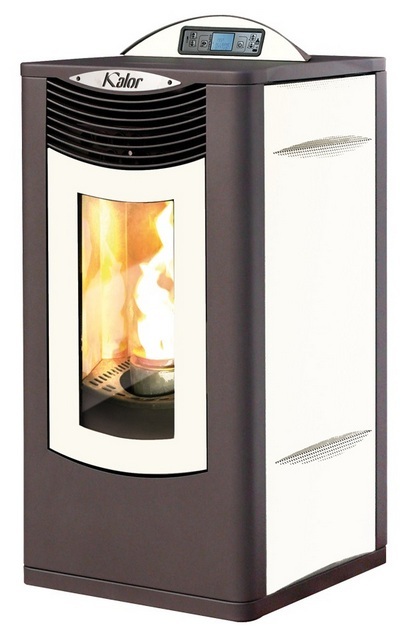 When compared to old heating methods such as open fires or solid fuel stoves, Kalor wood pellet stoves are a word apart. Automatic ignition, easy cleaning, hardly any ash, easy fuel management, no bog! There are many, many benefits to having a Kalor wood pellet stove, not least the fact that you will have more time to spend doing other things. 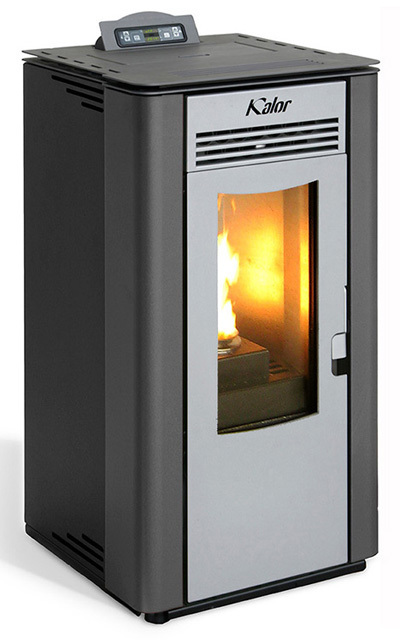 Kalor wood pellet stoves bring an unrivalled suite of controls and safety parameters to all models. All stoves can be programmed to switch on and off themselves, very useful to have that room nice and warm when you get up or arrive home from work. Automatic ignition is standard. Temperature limit thermostats, pressure switches, and audible alarms ensure you and your family's safety. You can programme your stove through the neat L.E.D. display or via the simple remote control, included with all stoves. For more information, please contact us; our experts will be happy to assist you or click the buttons below to be directed to our stove pages.